Evidently Spectra’s Andrea Grover was too obviously failing to convince people to stop worrying and love the Sabal Trail pipeline, because FPL President and CEO Eric Silagy has taken up the mighty megaphone of methane talking points. 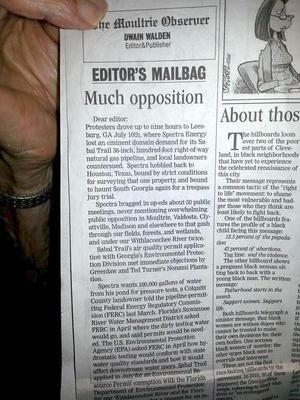 And the Gainesville Sun ran him on the same page as Merrillee Malwitz-Jipson and Jim Tatum of Our Santa Fe River, today, 18 August 2014. Here are the links and a few excerpts. Read ’em for yourselves! That’s actually an underestimate and may be my fault, because I originally computed adding another pipeline to the two of the same size already feeding Florida as a 33% increase. But 3/2 is a 50% increase, which I’ve corrected in FPL’s own projections don’t support need for a new pipeline. And 13% is even more less than 50%. Grover says Sabal Trail is not seeking approval to export gas. No, maybe not just now, but they can legally sell the gas after storage in Florida, and the buyer can export. The permits are written, the ocean is there, the ships are built, the scene is set. So, what are the assurances this will not happen? Absolutely none. What is the likelihood that it will? Absolutely pretty good. Or read the Congressional testimony of Paulaa Gant, head of the LNG export authorizing Office of Fossil Energy, which spells out that pipelines are to export fracked methane. Another possibility is that over time, liquefied natural gas may not be transmitted in this proposed pipe. Other liquids, such as water, could feasibly be moved through this infrastructure. The corridor, the pipe, and the permits would be in place. FERC representative John Peconom confirmed this at the Bell scoping meeting. The Sun’s July 30 editorial about the important effort to build a new natural gas pipeline system into Florida was both misinformed and misleading. If you recall, that editorial cited Greenlaw’s objections and FL Gov. Rick Scott’s stock ownership scandal, both of which are well-documented. Who’s misinformed? Natural gas is vital to the reliability and affordability of electricity in our state. Florida relies more on natural gas to generate electricity than any U.S. state other than Texas. However, unlike Texas, we aren’t a major gas producer, and we currently only have two major pipeline systems to transport gas to the peninsula — both of which are effectively at full capacity. Meanwhile, Florida’s economy continues to grow. To meet the growing need for electricity, Florida must have additional access to natural gas. Because Florida has made the mistake of depending too much on fracked methane, it should double down and become even more dependant? Even though Sabal Trail’s own figures say it would take half the land to produce just as much solar power? We’ve expanded our use of zero-emissions nuclear and solar power…. We’ve also invested more than $600 million in solar, having built the state’s first three solar-power plants. We firmly believe solar should play an increasing role in Florida’s energy mix in the years ahead, but like with everything else, we have to be smart about it. We support customers who have the means and desire to install their own solar panels, but we don’t support subsidization by all other customers. Large-scale solar plants that power all customers via the grid make a lot more economic sense than small, custom-designed rooftop installations that only benefit individual owners. Um, so why hasn’t FPL installed any more large-scale solar plants since 2011? And that’s a total of 35MW solar for FPL. Which makes Georgia Power’s four 30 MW military solar projects this year look really good by comparison. Quite a feat, FPL, making chronic solar laggard Georgia Power look like a leader! And that’s before the 525 megawatts more solar power GA PSC required last summer after massive activist lobbying, on top of the previous year’s 210 megawatts, for more than 735 MW total solar power required of Georgia Power by 2016. Which is still less than the 1,000 megawatts New Jersey already has installed right now. That’s right, FPL, you’re holding the Sunshine State behind New Jersey in solar power! Meanwhile, nuclear and methane, like coal, require massive amounts of cooling water, while solar, wind, and conservation do not. Merrillee Malwitz-Jipson and Jim Tatum, and on OSFR’s website. So, who will answer the WWALS op-ed? that appeared in the Moultrie Observer and the Ocala StarBanner? Maybe Spectra CEO Greg Ebel, who was fined for five points of failing to follow federal rules or his own company’s procedures for maintenance to prevent corrosion and leaks by the Pipeline and Hazardous Materials Safety Agency (PHMSA) in December 2013? Maybe he’d like to tell us about Spectra’s long rap sheet of corrosion, leaks, and explosions? Please, keep it up, Spectra and FPL! The more you expose your talking points to the public, the less people will believe them.